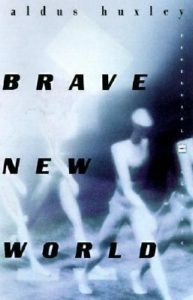 Brave New World by Aldous Huxley is not a text that lacks reviews or opinions, and attempting to contribute to the (often-polarizing) dialogue is a bit daunting. But I did finish the book, and I do have some impressions that I feel warrant sharing. I had a little trouble getting into this novel. I’m not new to science fiction, but something about the tone or style made it harder for me. Perhaps this is an intentional (almost sterile) approach to make sure we are distanced from the subject (experiment) as we take in the story. I took a bit of a liking to Helmholtz Watson, who became aware of his mental excess as a defect. The poor man realized he was an individual and could not quite grasp the ramifications of it (though he seemed to manage better than Bernard). Watson was “interested in something else. But in what?” – I loved how this line set up a juxtaposition. While having your life predetermined by all of the conditioning and class system can leave people seemingly lacking or lost (at least to the reader…), knowing you are an independent individual in a society that frowns on individuality or solitude can present its own problems. Balance seems to be the answer, but this was a world of extremes. The rigidity of routine, of the expectations on you (go to college, get a job, make the money, buy the house, etc), can leave one feeling “as though you had something inside you that was only waiting for you to give it a chance to come out…extra power that you aren’t using”. How profound! In a novel designed, in part, to point out extremes, I think we can also look at how these calls to action can apply to any one person’s life. To an extent, we all are part of a system. Even The Savage (poor John!) was in need of balance but unable to reconcile the brave new world enough to find it. “If one’s different, one’s bound to be lonely.” And for all of the knowledge he had from his books (often a loner’s best friend – as I can personally attest), he was not equipped to deal with the realities of the world he found himself in. The brave new world needed Shakespeare, religion, the old ways in a balance. But the uncivilized needed a dose of civilization to be able to cope in a mixed environment. For me, the best line of the novel was “…that the purpose of life was not the maintenance of well-being, but some intensification and refining of consciousness, some enlargement of knowledge”. With that refining can come the balance that we need as individuals to work in a less extreme society in this novel. But as The Controller reflected, this was “quite possibly true. But not, in the present circumstance, admissible”. For world order to occur, the individual must be lost to the system. For the uncivilized, individuals had more free range but the society as a whole was in a state of apparent disarray. Did this book live up to the hype surrounding it? Not for me. It is definitely sci-fi, but not for readers looking for a timeless sci-fi classic. Some of the plot devices are dated, and the book didn’t appear to stand the test of time as much as I would have hoped for a classic. If you are looking for an existential consideration of individuality or something a bit more philosophical, then this book may be for you. I appreciated the overall themes, but the story simply didn’t resonate with me.